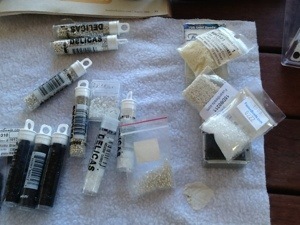 Haven’t done any beading in AGES! I’ve had a few things bubbling away in the back of brain, behind the baking plans and getting my legs working again plans and throwing out half of our possessions in the next cleanup plans. I went to a committee meeting last night that was planning, not a Fair or a Fete, goodness no, we’re a boys’ school, we’re all about the RUGBY! But a day of some description. My subcommittee is in charge of the bit that makes sure the Day is not just a long line of stalls supplying men dressed in black and white with sausages in the afternoon and egg and bacon rolls in the morning. I could go on at some length, but I’ll save for later, shall I? It just made me think of black and white jewellery again. The week after this Day is a grand and marvellous Black and White Ball and naturally some of us may want some black and white jewellery to go with our black and white frocks. I’ve been meaning to do another Bargello style necklace for ages and the last two I’ve done have been monochrome, so I think it would lend itself to black and white rather nicely. So to the choosing of the beads, and for any of you that have ever attempted to paint a room white, you’ll know that there’s white and there’s white. AmIright? I like to include Swarovski crystals wherever I can, and they only actually do two shades of solid white, chalk and alabaster. I only have alabaster, so that makes my white decision simple, stark white it is. The Ball invitation also suggests a touch of silver, so that’s going in too. The Bargello pattern that I use is from a 2006 edition of Bead and Button magazine and I’ve found that the pattern as written is a bit narrow and too short. 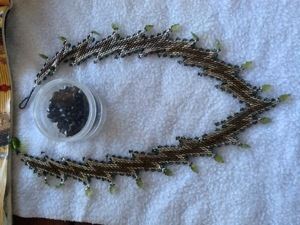 The first Bargello necklace I made is the only one I’ve kept, here it is. I’ve not offered it for sale, partly because I rather like it, partly because it is too short and narrow and partly because it has about fifty bucks worth of kyanite as dangles. I think it’s kyanite. Kind of an olive green gemstone, in leaf shapes. It’s also useful as a reference for starting a new necklace, it’s always a bit discombobulating. I manage to start it off successfully even with the distraction of having to shoo away a couple of Jehovah’s witnesses. I do wonder if they should have good hard look at themselves, the last few pairs have consisted of one non-English speaker and one very elderly somewhat English speaker. Different pairs. I think they’re losing their base. I haven’t the heart to play with them any more, they’re too pathetic. Well, here is what I’m up to. I think it will work nicely. The question is, do I keep it for my own swanlike neck, or should I put it up for silent auction at the Day That Is Not a Fair? Or should I sell it for filthy lucre? Mmmmm, filthy lucre. My favourite kind. 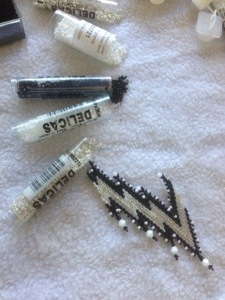 I have times where I don’t pick up my beadwork but when I do I do it for awhile!It’s wonderful isn’t it and addicting. Oh yes! Now I’m pacing up and down waiting for the Fusion order to come so I can really get a move on with it so I can start the next thing!